One of the most exciting rides has opened at Silver Dollar City. 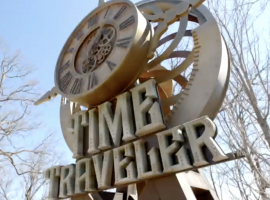 Time Traveler is the world’s fastest, steepest, and tallest spinning roller coaster! Each time a guest rides will be a different experience because of the 360-degree controlled spin that showcases a variety of perspectives. Time Traveler reaches top speeds of over 50 miles per hour and has its tallest point at 100 feet. When the ride first takes off, guests are sent down a 10-story, 90-degree vertical drop. Riders will then experience three inversions, a 95-foot tall loop, and a double launch, sending them from 0 to 47 miles per hour in three seconds and 30 to 45 miles per hour in 3.5 seconds. Along with the opening of this roller coaster, special food items and ice cream have also been introduced. Traveler’s Stop is the new restaurant that is right around the corner from the ride! Guests will enjoy fried chicken sandwiches, gourmet grilled cheese sandwiches, and twisted Time Traveler french fries! Time Traveler even has its own ice cream flavor. This specialty flavor features french silk ice cream, marshmallow bonbons, chocolate flakes, and thick fudge sauce. Don’t miss out on these new experiences at Silver Dollar City this season!